Last week was Dreamforce, the Salesforce.com annual conference. This year, the conference drew 45,000 to the event with about 35,000 expected to participate remotely. Utterly huge numbers for a technology conference. I participated online. Salesforce.com is the self appointed poster child of “the cloud” – the event was partially about CRM or enterprise software, and a lot about the cloud, social networking, real time computing, and (wait for it) unified communications. This should not be surprising, we know its all coming together – in UC circles we regularly talk about communication enabling CRMs, using social media to better know the customer, smart contact centers, and how mobile technologies improve productivity. But it still seems odd to see a CRM show talking about UC. Get off of my cloud! Using Twitter and Facebook for customer service, brand monitoring and sales generation. Pulling in contact information including photos and numbers from social media into coporate databases. The importance of presence and instant messaging. 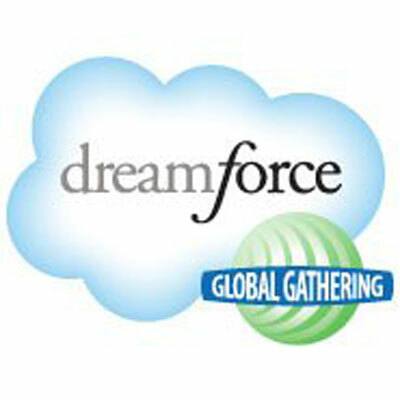 Of course, Dreamforce trumps up Chatter, but the notion is even more powerful on larger networks. They call it ChatterNow – includes screen sharing and file transfers. Just like many of the collaboration tools in UC. Chatter Connect API – connecting (federating?) chatter with other networks. The absolute importance of HTML5, and how it will liberate applications and developers from multiple clients. (Although they showed a new chatter client for IOS and Android). One demo had an agent take a call through a web browser. To better serve the call, the agent switched to a Facetime session and had the caller aim her iPhone camera at the item in question. Powerful stuff – visual conferencing and collaboration to a mobile device – another familiar topic – not to mention a softphone in the browser. Data Residency option (DRO) – allows an organization to store its Salesforce data on their premises instead of Salesforce’s datacenters. The big benefit is how sensitive data or data under regulatory limitations can be “secured” safely on premises. More importantly it shows the cloud moving toward hybrid solutions just as many of the premise vendors are moving toward cloud/hybrid as well. So clearly if the CRM folks are talking about UC, and the UC folks are talking about CRM, and both are talking about iPads, mobility, and productivity – we have something in common to IM about. I find it amazing that the CRM guys can get 45,000 attendees, Eric Schmidt, and Neil Young to show up to the conversation. I guess I need to talk more about CRM. How’s this: Three apps walk into a bar – CRM, ERP, and UC, and the CRM app threw-up over the others. It’s funny because its true. I found Benioff’s demos perplexing because there were no details behind his magic. For example, Facebook was a recurring theme, but he never mentioned FB’s partner in voice: Skype. Instead, somehow he ended up on a Facetime video chat through the Saleforce app on a browser. What browser plugin was doing his voice and video to Facetime? Regarding social, he gave an example of how Disneyland is using social media to pump their rides. The example involved a consumer tweet about an upcoming trip to DisneyLand and said consumer being elated to receive spam tweets back with a link to Disney’s Facebook page offering several lighten-the-wallet-while-in-LA apps. Benioff also poked at his favorite hotel for not knowing more about him. I think his vision is a bit creepy. Sometimes, I just want the role of Patron #3. I just don’t buy that social is that critical to business. I wonder if the Witness Protection Program now provides a full social background as part of its new identity services. The Salesforce world may have bigger shows, but it’s all the same stuff. There was plenty of Apple worshiping and MSFT bashing. Anyone not using Chatter – their proprietary solution – clearly doesn’t get social media, and it was the only place where I think people really want to “friend” or “like” conglomerates that want your money. Though one would expect a good salesman to be pitching selling at a conference about sales tools. Last year, the game changer was “the cloud,” this year, it was social. But the social cloud has a dark spot – enterprise adoption. Salesforce.com has the same problem hosted voice providers have – SMB loves it, now what? My impression is hosted UC is moving into the enterprise faster than hosted CRM. IBM, for example, is also pushing the social enterprise pretty hard. But only one of these companies have real enterprise experience. Hmmm. It was a very impressive show and I learned a lot. Social, the cloud, mobile, and local is what will define the next few years of technology innovation and spending. That’s why UC is so interesting right now. Put that in your CRM and smoke it.